Listen back to everything you may have missed on The Power Trip Morning Show, Monday-Friday 5:30-9am on KFAN 100.3 FM - The Twin Cities Sports Leader. This podcast features all our daily segments!. It's become one of the most popular and most competitive segments of radio in the country, and now it's on demand and at your finger tips! 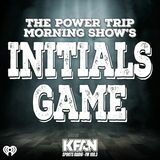 It's The Power Trip's Initials Game on Demand! Sometimes three-and-a-half hours is just not enough time to say everything that needs to be said. Sometimes Chad Abbott doesn't want us talking about certain things on the radio. This is The Power Trip Aftter Party, an after show podcast where anything goes! Everyday at 7:40am The Power Trip discusses the biggest, most controversial topics in the world of the Minnesota Vikings. It's "Vikings News" on The Power Trip Morning Show! A collection of the best interviews with celebrities and professional athletes that have joined The Power Trip throughout the week.